Today is Veteran’s Day in the United States. To all our veterans, active duty members of the military, and family members of veterans around the world I say THANK YOU. Thank you for your service. Thank you for your honor and integrity. Thank you for your patriotism and your sacrifices for our nation. We are a free nation and remain a republic in 2011 thanks to your willingness to serve alongside thousands of others in the long grey line. 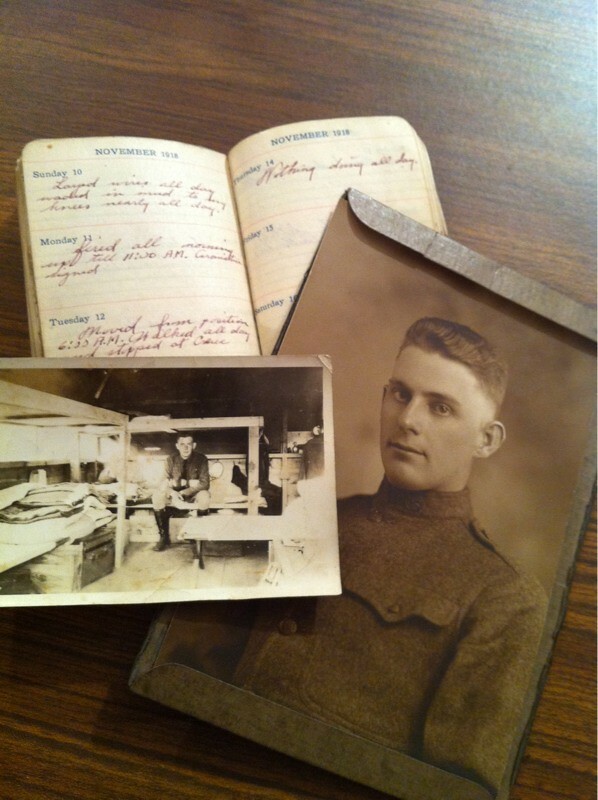 This morning at my Friday morning men’s group meeting, Gordon Anderson shared the diary of his grandfather who fought in World War I in the U.S. Army. He also shared some photos. The entry in his diary from November 11, 1911 (shown above) is short but highly significant. Fired all morning until 11 am. Armistice signed. That day is one we remember now on November 11, 2011. The price of peace. The sacrifices of a nation. The daddies who went off to war and never came home. The young men who lost their lives in a battle on a distant shore, and never grew older to know the great blessings of fatherhood. The dads and moms, sons and daughters, who serve today in places we might not recognize and might be challenged to pronounce. The servicemembers deployed to secret bases off the media radar screen. The friends and neighbors who will not be home for the holidays this year, because “duty calls” and they have answered. These men and women we remember today and thank. Today I am also thinking of the hundreds of Americans serving as military contractors for the United States abroad. Nations have employed mercenaries since the dawn of warfare, and today is no different. I am thinking of the families and friends who know intimately the cost involved in a headline, “Another car bomb exploded…” Whether they wear a military uniform or not, their death and sacrifice means the same thing to a spouse, a child, and a parent. May God grant wisdom and discernment to our leaders who order our servicemen and women into harm’s way. May we never forget their sacrifices, and may we always remember their service with gratitude.